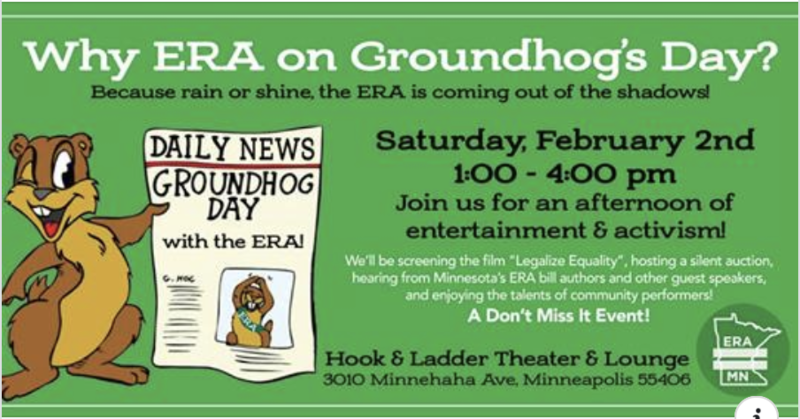 Act Now-Women's March Minnesota-Who’s coming to the ERA party this Saturday? Ready to celebrate last week's win in the House for Equal Rights Amendment bills, HF13 and HF71, with ERA MN ? Join us! They've got a stellar line-up of community performers (Katy Vernon, The Women's Band, Harley Synn, Jess C-a, Jenna Cis, and Tera Kilbride as MC WTF), a silent auction, a screening of "Legalize Equality," and you’ll learn next steps needed to pass these bills! We're so close, right? It’s all too good to miss. Saturday, Feb 2nd, 1:00 - 4:00 p.m.
Hook & Ladder, 3010 Minnehaha Avenue, Mpls, 55406. While you wait.. Take action! Contact your state senator and let them know why we need the ERA passed and urge them to ask for a hearing for the ERA bills (SF200 and SF208) in the MN Senate. This is particularly important if your represented by Sen. Limmer (SD34) or Sen. Gazelka (SD09). Not sure who your state senator is or how to contact them? Find out with this legislator look-up tool.